Namaste. My name is Joan Chamberlin, and I am an amateur astronomer, informal astronomy educator, and NASA JPL Solar System Ambassador for the state of Maine in the USA. 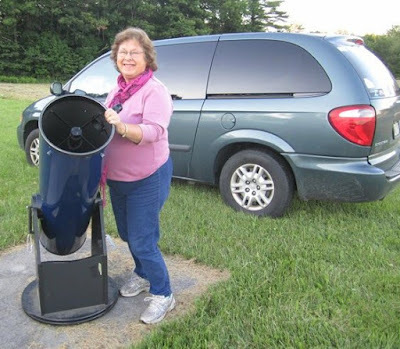 I am a retired special education teacher, who became involved in astronomy about 10 years ago mostly because I was interested in observing all the beautiful objects to be seen in the night sky with the naked eye and with telescopes. As soon as I learned how to use a telescope and began attending star parties with my friends at two different astronomy clubs, I realized that what I loved most of all was sharing my knowledge with schools and the public. Here is a picture of me at the Astronomical Society of Northern New England observatory in Kennebunk, Maine with my telescope, which is a 10 inch Dobsonian. Are you looking for an opportunity to become a leader! Hope you are enjoying reading my blog over the years and will follow the post in coming days :) Today, I am sharing you an opportunity to learn leadership and raise the voice of youths of your country to UN on Space Application. How many of you have heard of Space Generation Advisory Council (SGAC)? If you are aware of it then that's great, if not then I recommend you to have a look at its offical website: www.spacegeneration.org. The membership is free for all 18-35 years citizens of nations listed under UN regions. If you find your country in the website but did not find National Point of Contact ( NPoC) for it, it's a great opportunity for you :) Moreover if you did not find your country then that will be another great opportunity for you to be a leader. Once you send your application, the executive council of SGAC will review over it and you will be informed about the results in due time! The Global Hands On Universe(GHOU) Chapter for Nepal has announced the Galileo Teacher Training programme on March 31, 2012. The application for the participation has now open and closes on March 14, 2012. The programme is a partnership between GHOU Nepal Chapter, Nepal Astronomical Society (NASO) and Espro Foundation, Nepal. If you are teaching science in school or doing science with public in Nepal, do not wait to apply for the event. This training is the unique platform for all science teacher where they will be taught astronomy and space science so that they can give these knowledge back to their students at schools. As the deadline is less than two weeks away ( Wednusday,March 14, 2012), Spread news to those whom you think to be interested to this programme. All the best for those who have already applied and those planning for. Hope to see you all in Kathmandu!